These dark, rich, velvety tarts are ideal as a simple dessert with coffee or tea, or an end-of-dinner flourish with a fine dessert wine. If you like, garnish the tarts with grated orange zest. A small scoop of orange sorbet also complements the flavors. Make the crust: In a medium bowl, whisk the flour, sugar, orange zest, and salt until well blended. Add the butter. Using your fingers or a pastry blender, work the butter into the flour mixture until crumbly and some pea-sized pieces of butter remain. If time permits, refrigerate the flour mixture for 30 minutes. Drizzle the ice water over the flour mixture, 1 tablespoon at a time, mixing until all the flour is moistened and the pastry just clears the side of the bowl (add an additional 1 to 2 teaspoons water if needed). Using lightly floured hands, gather the dough into a ball. Shape into a disk, wrap in plastic wrap, and refrigerate for 1 hour. Remove the dough from the refrigerator and cut it into 8 wedges, then reshape each wedge into a disk without reworking the dough (if needed, let it sit out to soften slightly for easier handling). Roll each disk out to a 5- to 6-inch circle on a pastry cloth or lightly floured board with a cloth-covered rolling pin or between 2 sheets of heavy-duty plastic wrap. Transfer a circle of the dough to a 4-inch tart pan, easing it into place. Trim the overhanging pastry along the pan’s edge. Repeat with remaining disks. Refrigerate for 30 minutes to 1 hour. Preheat the oven to 375 degrees. Prick the bottom of each crust with a fork, line with a circle of parchment or aluminum foil, and fill to the top with pie weights or dried beans. Bake in the center of the oven until the edges begin to turn golden, 15 to 20 minutes. Remove the weights and parchment and bake until the crusts are golden, 8 to 10 minutes more. Remove from the oven and transfer to a wire rack to cool. Make the filling: In a small saucepan, warm the marmalade and strain it through a sieve, discarding any pulp. Brush the bottom of each tart shell with some strained marmalade. Place the chocolate in a medium bowl. In a small saucepan over medium heat, heat the cream and 2 tablespoons of the marmalade until small bubbles form around the edges of the pan. Pour the hot cream over the chocolate. Let stand for 3 to 4 minutes, then whisk until the mixture is smooth. Evenly divide the chocolate mixture between the tart shells. Allow the tart filling to set at cool (60 to 70 degrees) room temperature for at least 2 hours before serving. 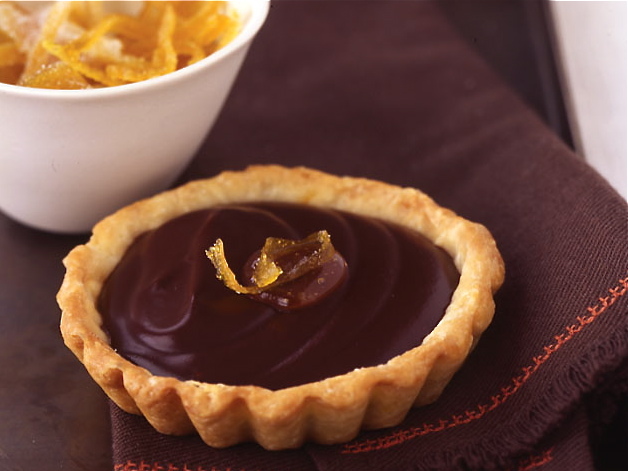 To serve: Add a dollop of the remaining marmalade in the center of each tart and garnish each tart with finely grated orange zest, if desired.